As a mother of two, I don’t have much time for prettifying before leaving the house. I spend way less time doing my hair, getting dress and putting on make-up compared to my pre-child days. Yet I still want to look put together, whether it’s headed to a work meeting or a play date with the kids. 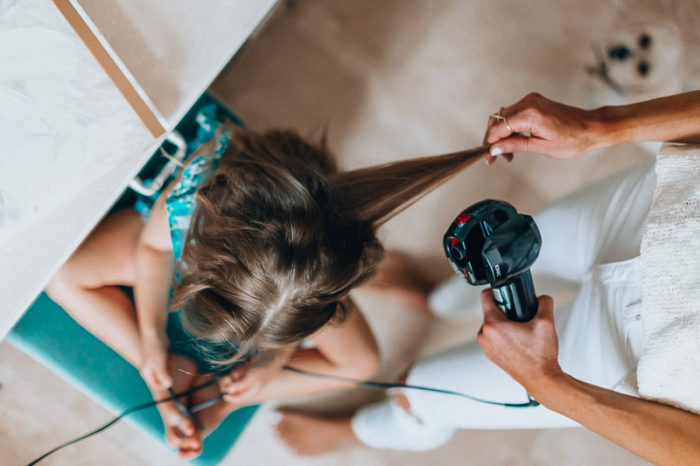 Here are a few tips on how I manage to look put together, get the kids looking good and getting out the door quickly. I try to get everything ready the night before that I possibly can. Shower at night after the kids are in bed. Lay out what you are going to wear, even if it’s yoga leggings and a pullover. Don’t forget shoes and accessories. If I don’t think about what I am wearing or lay it ALL out, I get flustered in the morning rush. Have the kids’ snacks or breakfast prepped. I pre-wash fruit, pack snacks and water bottles, sippy cups the night before. 1// I make time to wash my face every single morning! I feel so much better and more awake after I do this! 2 // Instead of doing your whole makeup routine, stick to a couple of basics that highlight your best features. For me, that’s putting on mascara, concealer, and bronzer! 3 // Get up earlier. 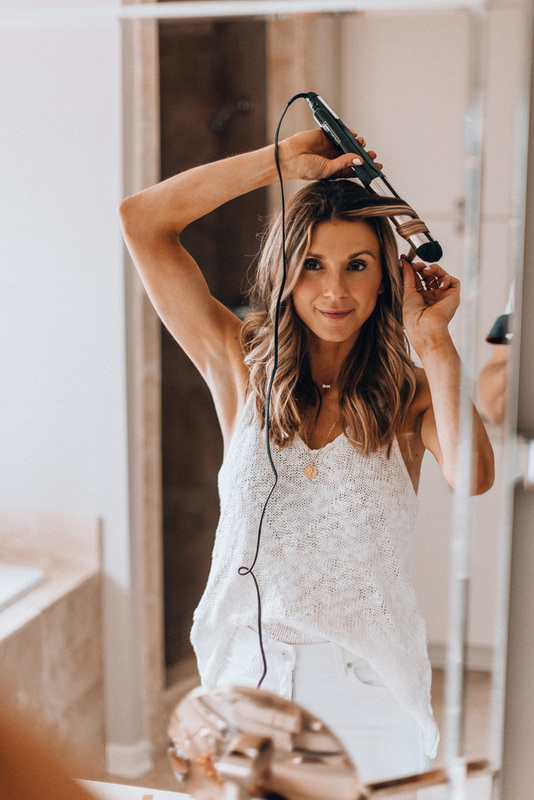 I find it’s a lot easier to get myself up and get ready before waking the kids so I have all the time to focus on myself rather than having to multitask. 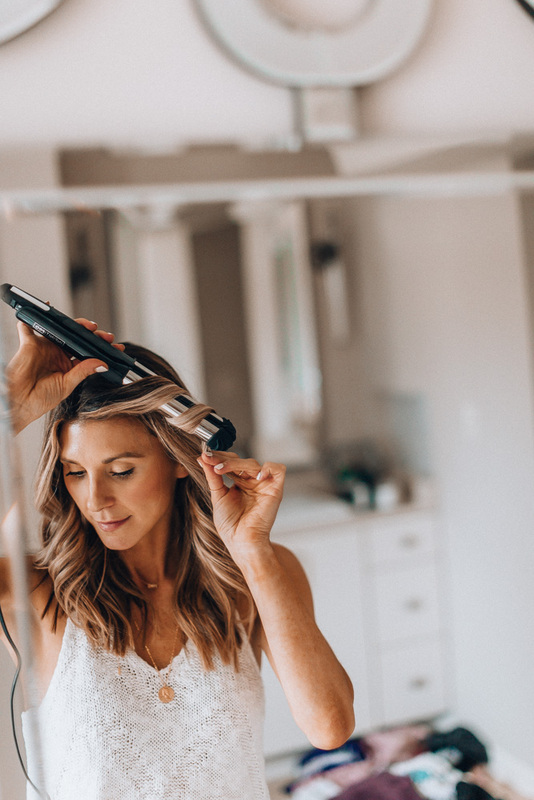 For easy curls or for straightening my hair I love Conair Infiniti Pro 2-in-1 Styler. 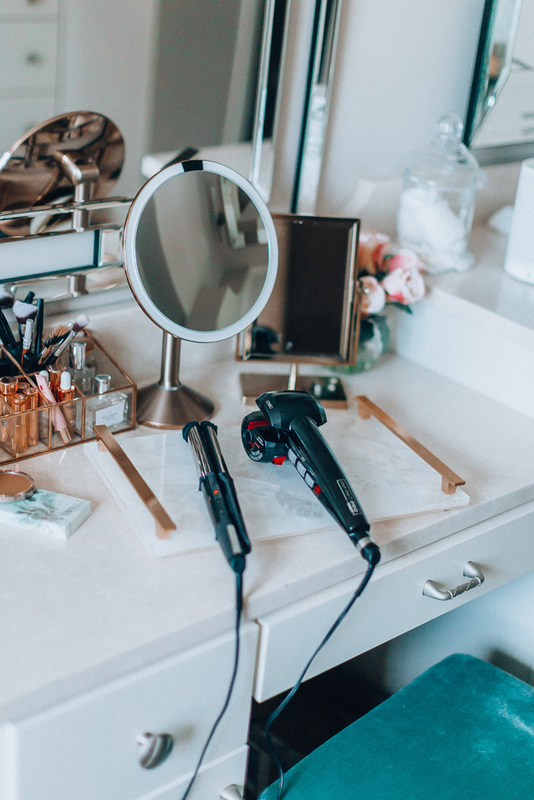 I appreciate that it works double time as a flat iron and curling iron, so depending on what I want my hair to do that day, I only need that one tool. 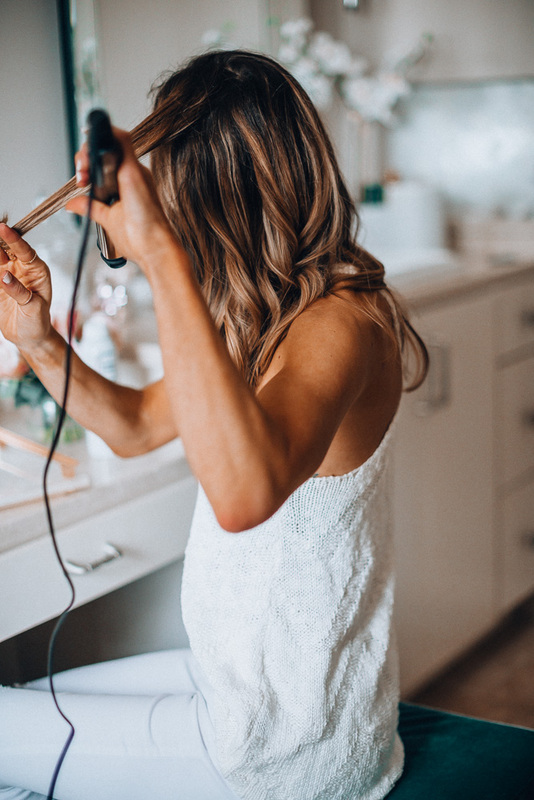 *Tip-when you are in a pinch for time, curl the top layers of your hair (leaving ends out) and just a few pieces underneath for a natural wave where you don’t have to curl every piece of hair. Other days I use the flat iron just to smooth my hair from the night before and put in into a sleek pony or topknot. Some days I have photoshoots with Sutton and I need her ready as well. 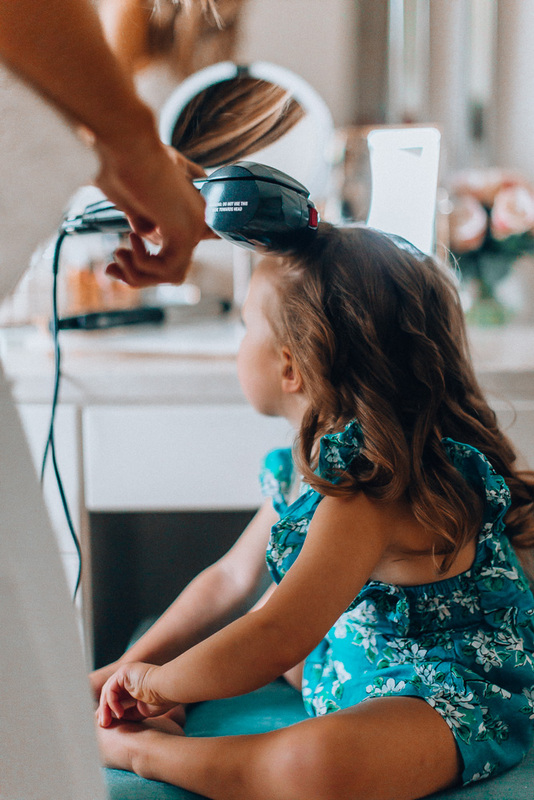 She just started asking to have her hair curled like mom, which is so sweet, and luckily I have a great tool for quick and easy curls on her. I love using Conair’s Infiniti Pro for Sutton’s curls. The first time I used it, it took awhile to get the hang of, but now with a little practice, and learning how much hair I can put into the barrel, I have her hair curled in less than 5 minutes and it lasts all day on her! 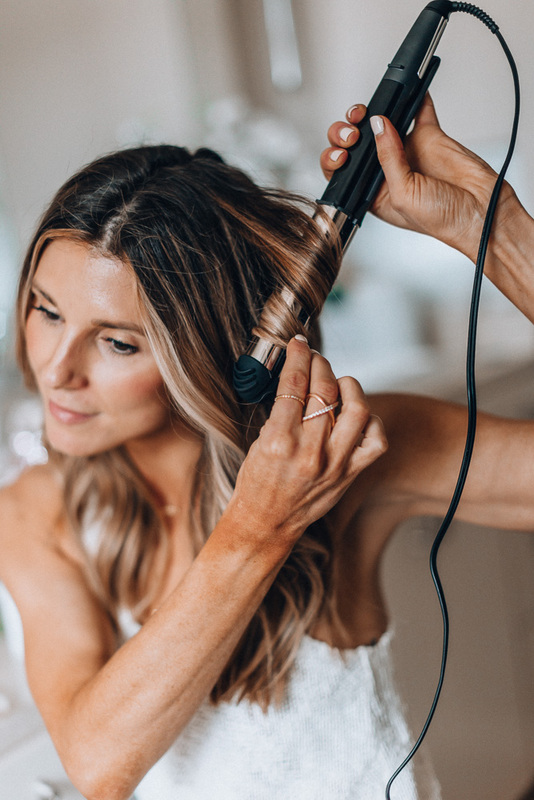 How it works: Hair is automatically drawn into the ceramic curl chamber where it is gently held, timed and heated from all directions to form the perfect curl. What I also love, is that it’s safe for when Sutton has any sudden movements, she won’t get burned by it, like a traditional curling iron. Sutton loves to get ready with me. So I ask her to “help” put blush on or wash our faces. So she can do it, while I do it as well. It makes it easy to get her hair curled when she sees me doing in on myself as well! I babyproof my entire master bathroom. So if needed I bring Greyson in to play while I finishing getting ready quick. Sutton will sometimes pack her own backpack. I make it fun and tell giver her a timed goal to get her backpack packed in 3 mins and she thinks its so fun to do before my iphone timer goes off! Take your breakfast and coffee to go in the car! Have snacks in the car ready to go! I keep lipstick and mascara in my purse in case I need it, or didn’t have time to apply at home and just do it in the car instead. Who cares if you show up with your yoga pants inside out? We all have been there! Just remember you are a beautiful woman/mother, and raising kids is a lot of work! Who cares if you don’t have the trendiest makeup or latest fashion? As I am reminded on a daily basis, the kids grow up so fast and before you know it, they will be 18 and out of the house! 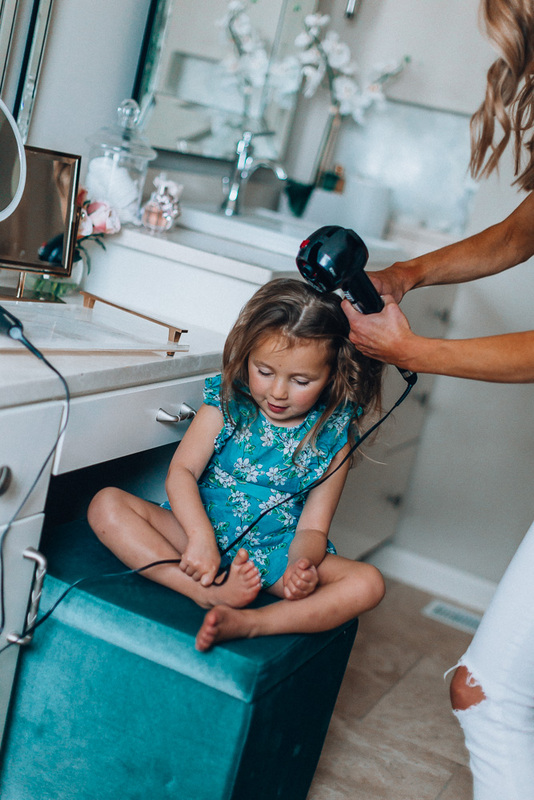 Embrace the hot mess and remember these tips to hopefully make mom life and getting ready a little easier! #2. Leave a comment on this blog post or my IG post! Leave me a comment telling me what you love most about your mom or being a mom or tag another mother you think would appreciate these tips! Love this. Getting myself ready can seem so selfish and stressful but prioritizing and prepping is truly helpful. My mother had four of us but still managed to keep it together and looked flawless! Great post! I agree that planning ahead is the number one thing you can do to make life simpler. I get up earlier than usual, and have everything ready the night before. The only thing I wish I could do is curl or straighten my hair in 5 min. Long hair probs lol! I love being a mom to my daughter and two sons. Every day they remind me that everyone is different and we need to respect what makes us unique in our own special way. The best part of being a mom is how much these kids make me laugh! They are so wild and crazy that I know I’m going to miss that when they are older! If you get a chance, buy the children’s book, Let me hold you longer by Karen Kingsbury. Wonderful reminder that they don’t stay little forever and to cherish that time! Thanks so much for sharing! 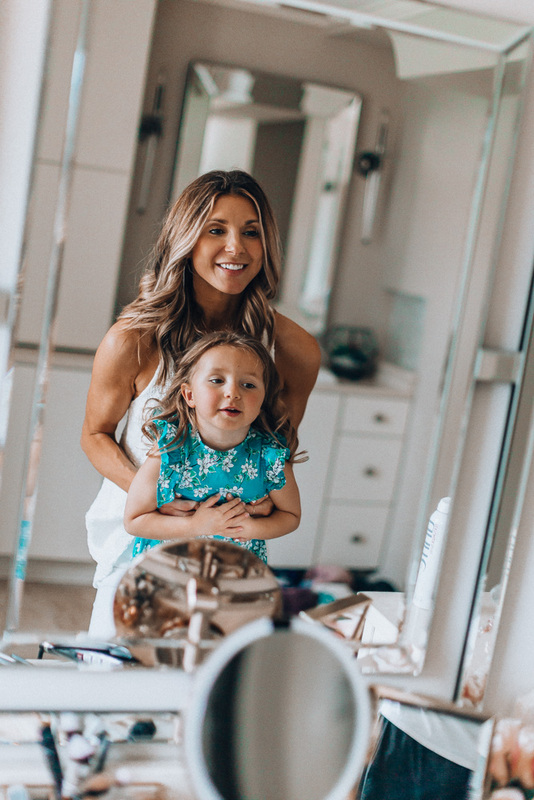 I dont have kids yet but I constantly feel like I dont have time to stay healthy (excersice, eat a healthy breakfast) AND look put together unless I wake up an extra 2 hours early haha so I will be using these tips for sure! My mom was always present and involved in my life, even while being a crazy busy transplant physician. She taught me what kindness and positivity look like and how much they can impact the people around you. There are so many reasons I love my mom, but these embody the essence of who she is to me. Love your tips and your style! Can you share info on the top you are wearing? It’s so fun! XO!